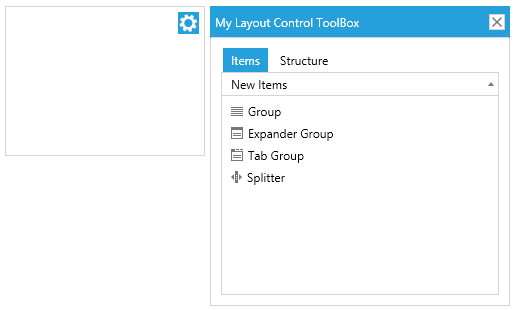 LayoutControlToolBox can be used to embed the toolbox into the layout control. This article demonstrates how to set it up and associate it with RadLayoutControl. This section shows a sample toolbox definition. Initially, the LayoutControlToolBox displays a single toggle button (see Figure 1). The toggle button will be displayed only if the layout control is in edit mode. When the button is clicked the toolbox view will be opened in a popup. You can manually control the state of the toolbox through the IsOpen property of LayoutControlToolBox. The popup of the LayoutControlToolBox component contains a LayoutControlToolBoxView element. 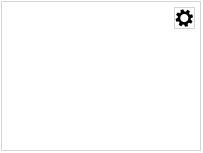 You can use the ToolBoxView property to get this element and modify it. 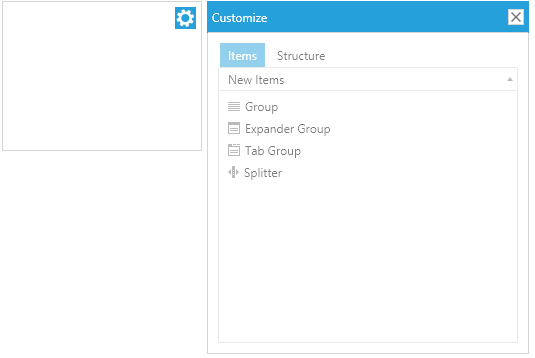 Or to define a new toolbox view and assign it to the LayoutControlToolBox. The toolbox view is displayed in a RadWindow element which can be customized through the WindowStyle property of LayoutControlToolBox. The BasedOn setting is applicable only in a scenario with implicit styles. This attribute is set so that the custom style inherits the default toolbox window style. 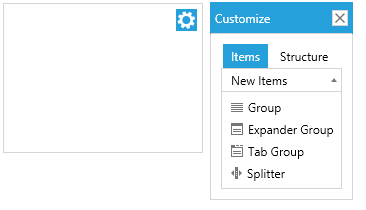 The LayoutControlToolBoxWindowStyle is located in the Telerik.Windows.Controls.Navigation.xaml ResourceDictionary. The button that opens the toolbox can be re-positioned in the additional items canvas of RadLayoutControl. This can be done via the Canvas.Left, Canvas.Top, Canvas.Right and Canvas.Bottom properties.